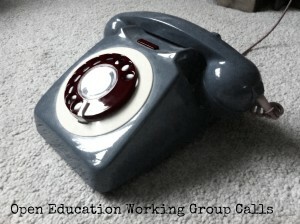 The Open Education Working Group have regular calls. These are an opportunity for us to get to know each and a chance for us to get the group active. All calls use an etherpad and currently take place in Google Hangouts. The next call will be in autumn 2015. You can register for the calls using the online form.